With competition from the likes of the BMW 5-Series, the Mercedes-Benz E-Class, and the Audi A6, it’s clear that Cadillac faced an uphill battle when they brought the CTS into the midsized sport sedan fray back in 2002. Since then we’ve seen the CTS-V best the Germans on their own turf with a record-setting Nurburgring lap time and a steady series of tweaks and refinements as the car matured but, performance notwithstanding, there’s always been a sense that while the CTS made for a great midsized sports sedan, it still existed a step or two below its European rivals as an overall package. Last year marked the debut of the all-new third generation CTS, which brought with it a striking new design, a longer wheelbase, a lower roofline, and debut of the Vsport trim level which slots between the base model and the as-yet unannounced CTS-V. Even a brief glance at the new car made it clear that Cadillac was in it to win it with the new CTS, but with the firm foothold of the established players in the segment, would it be enough? We spent a week with the CTS Vsport to find out. What is the idea behind the Cadillac CTS Vsport? As the name suggests, the Vsport model ups the ante performance-wise with a twin turbocharged V6 that’s mated to a paddle-shifted 8-speed automatic gearbox, along with a sportier suspension tuning that utilizes GM’s latest iteration of Magnetic Ride Control and a set of Pirelli high performance summer tires. Slotted between the base CTS, which is equipped with a naturally aspirated 3.6-liter V6 or a turbocharged 2.0-liter four cylinder, and the inevitable but not yet revealed CTS-V, which will likely see a supercharged V8, uprated suspension and beefier brakes to go along with the requisite aesthetic and creature comfort upgrades, the Vsport will eventually split the difference between the two trim levels. But for time being, the CTS Vsport sits at the highest chair of the portfolio. Those cross shopping cars like the Mercedes-Benz E550, the Audi S6 and the BMW 550i would be wise to include the CTS Vsport on their test drive list. Likewise, buyers already hooked on the idea of a CTS could easily be lured in by the significant enhancements offered in Vsport trim over the base model, especially when considering the fact that our Vsport tester came in under $60K before destination charge. How does the CTS Vsport handle? The latest version of Magnetic Ride Control - GM’s adaptive damping system - typically works wonders on the vehicles that it’s fitted to, and it does not disappoint on the Vsport. Left in Tour driving mode, the CTS offers a ride quality that’s virtually devoid of harshness while avoiding the unstable "floaty" sensation that often plagues the most compliant settings of adaptive suspension setups used on luxury cars. Even though things firm up substantially in Track mode, the CTS feels so well buttoned down that it rarely annoys. In that sportiest of settings, cornering remains largely flat but hints of body roll become evident during the most demanding tasks. Remembering that this is intended to be a mid-level version of the sport sedan, the tuning seems entirely appropriate. The Vsport feels inspires confidence when driven spiritedly, thanks in part to its near-perfect 50/50 weight distribution, as well as the diet applied to the newest CTS model, which drops some 200 pounds or more from the second-generation CTS depending on options, helped by the extensive use of aluminum in its construction. The CTS Vsport’s steering feels genuinely precise and offers variances in weight depending on which driving mode the vehicle is set to. Perhaps unsurprisingly, we found ourselves preferring the weight of Track mode – while the electrically assisted ZF rack only provided limited feedback through the wheel, the additional steering weight yielded less requirement for mid-corner corrections and was just generally more enjoyable when we wanted to have some fun with the car. And fun we had – between the excellent balance, rigidity, well sorted suspension and the tenacious grip of the Pirelli PZeros, the CTS Vsport proved to be a truly rewarding car to drive hard down our favorite back roads. How does the drivetrain of the CTS Vsport perform? The CTS Vsport boasts a twin turbocharged 3.6 liter V6 much like the unit found in the XTS Vsport we tested earlier this year. 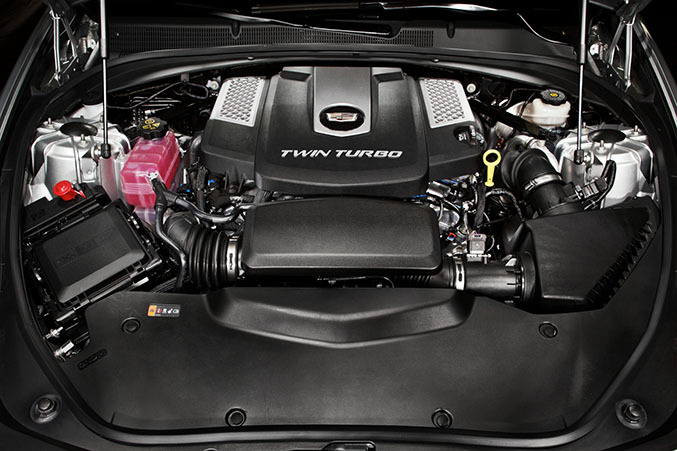 Here the engine makes 420 horsepower and 430 pound-feet of torque, up almost a hundred horsepower and 156 lb-ft from the naturally aspirated V6 found in the base CTS. It’s a noticeable increase. And unlike the XTS’s front wheel drive based AWD system, the CTS sends all its power to the rear wheels, and the Vsport does so by way of an 8-speed automatic gearbox. The result is an authoritative 0-60 dash of 4.6 seconds and responsive, snappy shifts at our command via the posh magnesium paddle shifters. While the gearbox also seemed up to the task of shifting on its own at the right time in Sport and Track modes, regardless of what setting the car was in or whether we called for shifts or the computer did, the speed of each shift seemed just a touch slower than those offered by ZF 8-speed unit found in cars like the Jaguar F-Type and the BMW M235i. The twin turbocharged V6 makes a solid pairing with the CTS and the boost starts to come in low in the rev range, with power delivery staying more or less linear up to redline. Sonically, the 3.6-liter lacks the refinement and overall aural presentation of something like a BMW straight six, but engine noise is subdued enough within the cabin that it’s unlikely to be much of a factor to most. 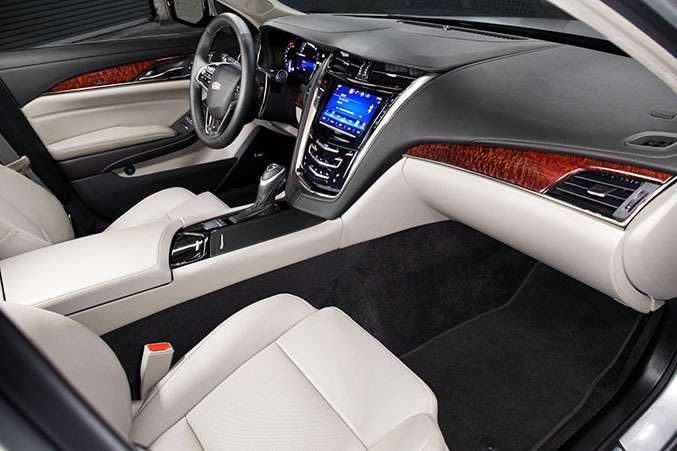 How comfortable is the CTS? It’s here that the CTS really shines. The car’s new rigid aluminum construction coupled with Magnetic Ride Control yields one of the most composed vehicles we’ve ever driven. Potholes, rail road crossings, and other road maladies are dispatched with total aplomb, and the CTS Vsport remains unfazed by road undulations at speed regardless of what driving mode the suspension is set to. This car feels how we expect a modern Cadillac to feel – the sense of isolation from undesirable elements of the road do not detract from the overall driving experience, and instead create a wholly legitimate sense of luxuriousness. As we mentioned in our ATS drive, the CUE system has improved substantially even since our time with the XTS and is no longer plagued by the slow-to-respond frustrations we experienced there, though we’re still not sold on the whole capacitive button center stack layout. Fortunately, many of the most common functions, like the audio controls, are accessible on the steering wheel via actual buttons, which we used whenever possible. In terms of technology, our CTS came equipped with a host of safety features, include side blind zone alert, lane departure warning, forward collision alert, rear cross traffic alert, and several others. Working in tandem, the systems can be a bit much to stomach, like an overbearing parent vocally critiquing even the most benign maneuvering commonly found in Los Angeles traffic. Fortunately most of these systems are adjustable or defeatable, so if you find it to be over the top, most of it can be adjusted to taste. 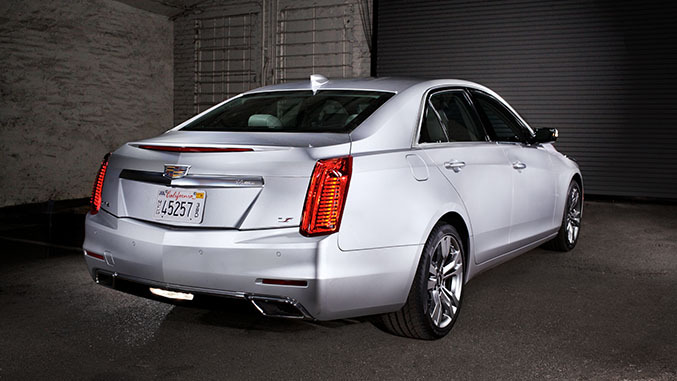 New for 2015, the CTS also offers 4G LTE connectivity – something even tech pioneers like Tesla have yet to offer. In an era where LTE Wi-Fi hotspot capability is available on most new phones the feature might already be redundant for a portion of buyers, but it’s handy to have none the less, as is the new-for-2015 standard wireless phone charging pad. How is the design when seen in person? The CTS features the latest application of Cadillac’s angular Art and Science design language and, simply put, it’s the best rendition of it we’ve seen yet. In the past the pronounced lines of previous Cadillacs tended to yield both flattering angles and some much less so, but the new CTS looks stylish and graceful from just about every angle. Modern without looking gimmicky, elegant without looking pretentious, and aggressive without resorting to machismo – the CTS, to our eyes, one of the best looking sedans in the segment. It’s often the case with mid-range trim models - as the Vsport is designed to be - that there’s a subtle but unshakable sense of lacking, some element left unfinished or incomplete. That just isn’t the case with the CTS Vsport. Sure, we’d love to have a snorting supercharged V8 under the hood, along with massive brakes and the option of a manual gearbox, but that’s really a fundamentally different car. 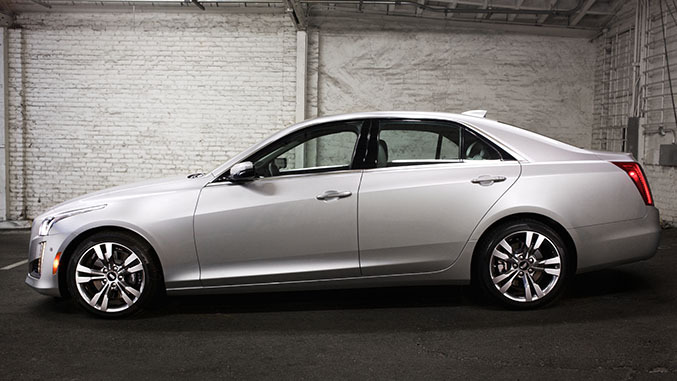 As a luxury grand touring sports sedan, the CTS Vsport is exceptional, both in terms of its capability and its value. While we anxiously await the arrival of the full-blooded, high performance-focused CTS-V, the Vsport should be (and is) more than enough to worry its European rivals.